All laws or regulations hereunder are either reproduced verbatim from the Fish and Game Code or from Title 14 of the California Code of Regulations (CCR), as adopted by the Fish and Game Commission under authority of the Fish and Game Code. Angling means take of fish by hook-and-line with the line held in the hand, or with the line attached to a pole or rod held in the hand or closely attended in such manner that the fish voluntarily takes the bait or lure inside its mouth. 1.39. Coastal Pelagic Species Defined. Coastal pelagic species means any of the following: northern anchovy (Engraulis mordax), Pacific sardine (Sardinops sagax), Pacific mackerel (Scomber japonicus), jack mackerel (Trachurus symmetricus), and market squid (Loligo (Doryteuthis) opalescens). 1.49. Highly Migratory Species Defined. Highly migratory species means any of the following: albacore, bluefin, bigeye, and yellowfin tuna (Thunnus spp. ); skipjack tuna (Katsuwonus pelamis); dorado (dolphinfish) (Coryphaena hippurus); striped marlin (Tetrapturus audax); thresher sharks (common, pelagic, and bigeye) (Alopias spp. ); shortfin mako shark (Isurus oxyrinchus); blue shark (Prionace glauca), and Pacific swordfish (Xiphias gladius). A stream is a body of water that flows at least periodically or intermittently through a bed or channel having banks and that supports fish or other aquatic life. This includes watercourses having a surface or subsurface flow that supports or has supported riparian vegetation. 1.84. Titles and Section Numbers. All titles and headings used in these regulations are a part thereof. All section numbers cited refer to these regulations unless otherwise specified. A public pier is a publicly owned man-made structure that has the following characteristics: is connected, above the mean high tide, to the main coastline or to the landmass of a named and charted natural island; has unrestricted free access for the general public; and has been built or currently functions for the primary purpose of allowing angling access to ocean waters. 1.90. 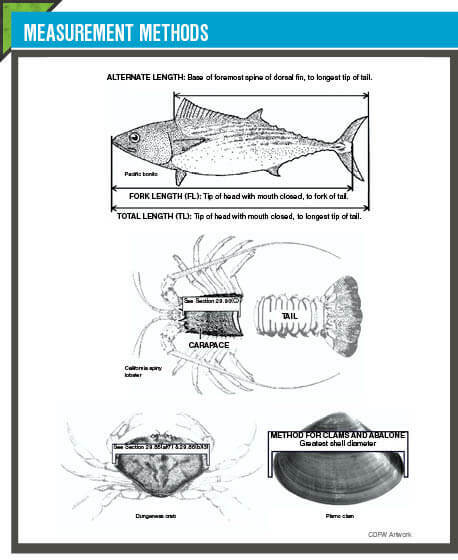 Nearshore Fish Stocks, Nearshore Fisheries, Nearshore Waters, and Shallow Nearshore Rockfish Defined. (a) Under the authority of Section 8587.1 of the Fish and Game Code, Section 8586 of the Fish and Game Code is made inoperative. (c) “Nearshore fisheries” means the commercial or recreational taking, possession, or landing of any species of nearshore fish stocks. (d) “Nearshore waters” means ocean waters including around offshore rocks and islands extending from the shore to a depth of 20 fathoms. (e) “Shallow nearshore rockfish” means a sub-group of rockfishes (genus Sebastes) including only black-and-yellow rockfish, China rockfish, gopher rockfish, grass rockfish, and kelp rockfish. 1.91. Federal Groundfish and Rockfish, Cabezon and Greenling (RCG) Complex. (b) “RCG Complex” means all species of rockfish (Sebastes), cabezon (Scorpaenichthys marmoratus), and kelp and rock greenlings (genus Hexagrammos). (a) Pursuant to sections 7923 and 8026, Fish and Game Code, the owner and operator of a commercial fishing vessel or the holder of a commercial fishing license or permit participating in specified fisheries, and the owner and license holder of a commercial passenger fishing vessel shall keep and submit a complete and accurate record of fishing activities. (b) Fishing activity records shall be kept on paper forms provided by the department or on the electronic version on the department web site at https://apps.wildlife.ca.gov/marinelogs, hereafter referred to as logbook(s) for purposes of this section. (3) at the end of the calendar day (24 hour clock) during fishing activity through the night. (d) If the logbook is kept on paper it shall be delivered to the department at 4665 Lampson Avenue, Suite C, Los Alamitos, CA 90720, or such other department office as may be specified in regulation on or before the 10th day of each month following the month to which the records pertain. Logbooks that are mailed shall be postmarked on or before the 10th day of each month following the month to which the records pertain. (e) Failure to keep and submit required logbooks may result in revocation or suspension (including non-renewal) of the license or permit for the taking of all fish or for the particular species for which the records are required, by the department, for a period not to exceed one year. Any revocation, suspension or nonrenewal may be appealed to the commission. 195. Report of Fish Taken to be Made by Owner of Barge or Vessel for Hire and Boat Limits. (a) Pursuant to Section 190 the owner/operator of a commercial passenger fishing vessel shall keep a logbook of fishing activities. (1) The form entitled Commercial Passenger Fishing Vessel Log, Central and Northern California, DFW 195A (Rev 01/16), incorporated by reference herein, shall be used when the vessel is engaged in fishing north of Point Conception. (2) The form entitled Commercial Passenger Fishing Vessel Log, Southern California, DFW 195B (Rev 01/16), incorporated by reference herein, shall be used when the vessel is engaged in fishing south of Point Conception. (b) The owner(s) and/or operator(s) of each vessel required to obtain a license under Section 7920 of the Fish and Game Code shall post a notice in a prominent place on the vessel giving information to fishermen on license requirements, bag limits, and other pertinent information. This notice shall be furnished by the department. (c) Both the vessel owner(s) and/or operator(s) shall be responsible for keeping accurate records and insuring the vessel is in compliance with sub-sections (a) and (b) above. (d) All fishing activity records are confidential pursuant to Fish and Game Code Sections 7923 and 8022 and Government Code Sections 6276 and 6276.10. (e) Boat Limits: When two or more persons licensed or otherwise authorized to sport fish in ocean waters off California or in the San Francisco Bay District, as defined in Section 27.00, are angling for finfish in these waters aboard a vessel licensed under Section 7920, fishing by these persons (to include vessel operator(s) and crew members where licensed to sportfish under their own individual limits) may continue until the passenger’s boat limits of those finfish are taken and possessed aboard the vessel as authorized under this section. (1) For purposes of this section, the vessel operator(s) and crew members are not passengers and may not take fish towards obtaining boat limits for passengers except for casting, setting trolling gear, gaffing or netting fish, but may take fish during a fishing trip for their personal use only. Vessel operator(s) and crew members may assist passengers in other activities including, but not limited to, obtaining bait, chumming, baiting and untangling hooks and lines, identifying, dispatching, filleting, counting, bagging and otherwise handling fish taken by passengers. Upon completion of a fishing trip, the vessel operator(s) and crew members may only possess fish that are part of their own personal bag limit not to exceed authorized sportfishing daily bag and possession limits. (2) Fish taken by operator(s) and crew members for personal use pursuant to (e)(1) above must be separated from fish taken under a boat limit and labeled in a manner that they can be identified as an individual operator’s or crew members fish. Operator(s) and crew members are also prohibited from giving all or part of their individual limit to any passenger during or after a trip. (3) The authorization for boat limits aboard a vessel does not apply to fishing trips originating in California where fish are taken in other jurisdictions. are licensed or otherwise authorized to sport fish in ocean waters off California or in the San Francisco Bay District multiplied by the individual daily bag limit authorized for a species or species group. For purposes of this section, the number of passengers shall not include the vessel operator(s) and crew members. It is unlawful to exceed the boat limit at any time. (5) Prior to the departure on a fishing trip of a vessel that is licensed under Fish and Game Code Section 7920, the number of fishers, to include passengers, guests, operators and crew who will be fishing, shall be recorded under “number of fishers” on the logbook for that trip. In addition, the number of vessel operator(s) and crew members who will fish for that trip shall be recorded in the space to the right of the operator’s signature on the logbook. (6) Upon completion of a sport fishing trip aboard a vessel reporting under this section, each licensed or otherwise authorized angler may not possess more than the daily bag and possession limits. For the purposes of this section, a fishing trip is completed at the time a person disembarks from the vessel and individual possession limits apply. (7) Species for which no daily bag limit exists are not included in the boat limit. (g) Boat limits are not authorized for sturgeon fishing and shall not apply to the take, possession or retention of sturgeon.